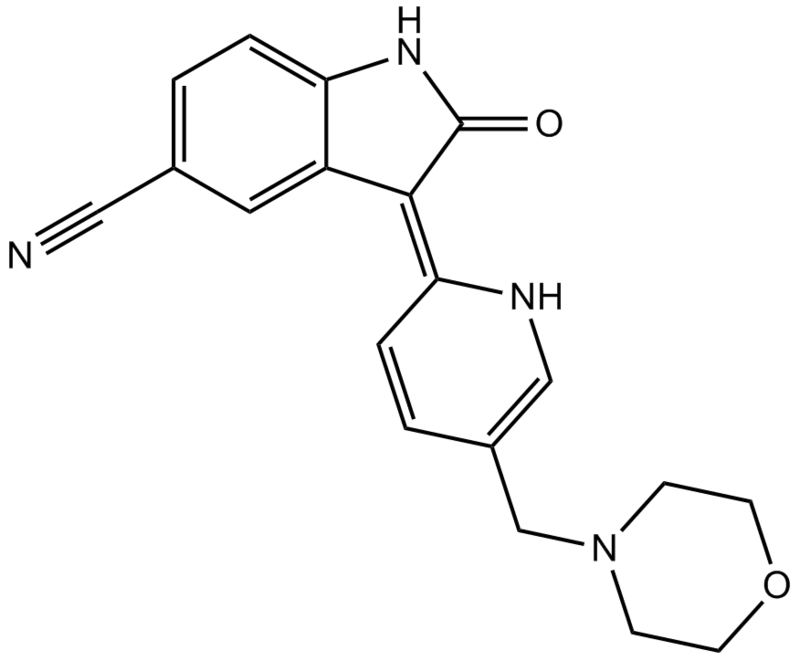 Description AZD1080 is a selective, orally active, brain permeable inhibitor of GSK3 with Ki values of 6.9 nM and 31 nM for human GSK3α and GSK3β, respectively. AZD1080 inhibits phosphorylation of human tau protein in a concatenation-dependent manner (IC50 = 324 nM). The non-selective reference GSK3 inhibitor LiCl (IC50 = 1.5 mM) indicating that AZD1080 is several orders of magnitude more potent than LiCl. AZD1080 (3 or 10 lmol/kg); oral gavage (6 mL/kg). 6 h after administration of AZD1080, it inhibits the tau phosphorylation by maximal of 38±2% and 48±2% in hippocampus, indicating AZD1080 is effective at inhibiting tau phosphorylation at the P-Thr231 epitope, in a time- and dose-dependent manner in brain. In addition, AZD1080 reverses cognitive deficits in mice and rescues dysfunctional synapses. AZD1080 is a novel, potent and selective inhibitor of Glycogen synthase kinase-3β (GSK3β) with the Ki values of 6.9 nM and 31 nM, respectively . AZD1080 has been reported to inhibit GSK3β by binding within the ATP pocket by means of the high resolution X-ray crystal structure. In addition, AZD1080 has been noted to suppression recombinant human GSK3α and GSK3β with the Ki values of 6.9 nM and 31 nM, respectively. AZD1080 has also shown the selectivity against other kinases with the Ki values of 1150nM, 429nM,1980nM and >10μM for cdk2, cdk5, cdk2 and Erk2, respectively. 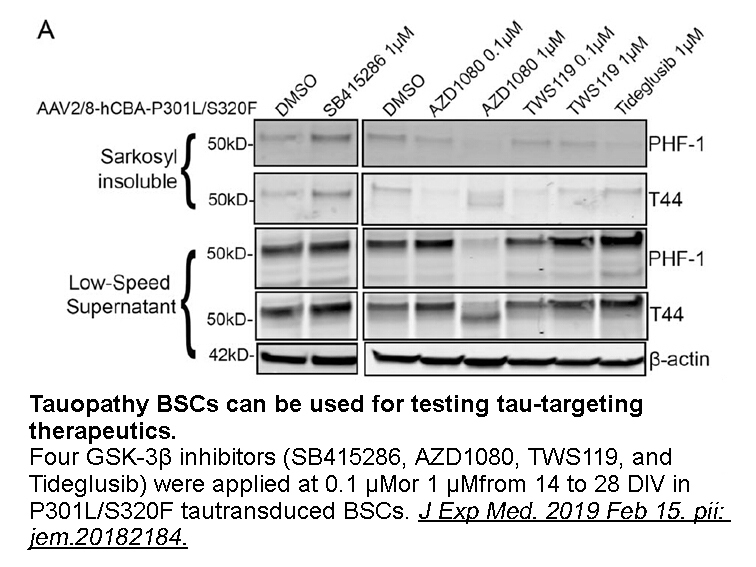 Furthermore, AZD1080 has been revealed to concentration-dependently inhibit tau phosphorylation with the IC50 value of 324nM in 3T3 cell lines. Besides, AZD1080 has exhibited the good oral bioavailability the high blood – brain barrier permeability values of 8 ×10-3cm/min in rat . Georgievska B1, Sandin J, Doherty J, Mörtberg A, Neelissen J, Andersson A, Gruber S, Nilsson Y, Schött P, Arvidsson PI, Hellberg S, Osswald G, Berg S, Fälting J, Bhat RV. AZD1080, a novel GSK3 inhibitor, rescues synaptic plasticity deficits in rodent brain and exhibits peripheral target engagement in humans. J Neurochem. 2013 May;125(3):446-56.